MERRILLVILLE, IN: Bishop Demetrios of Mokissos, Chancellor of the Greek Orthodox Metropolis of Chicago, visited Ss. Constantine & Helen Greek Orthodox Cathedral in Merrillville on Sunday, December 4. 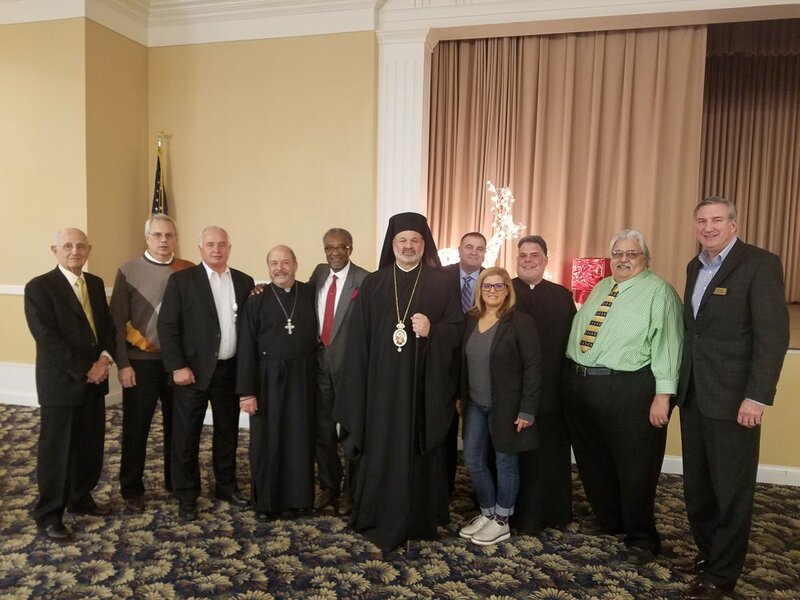 Bishop Demetrios officiated Sunday Services and updated parishioners on the status of the important resolution in support of the Ecumenical Patriarchate of Constantinople coming before the Indiana State Legislature in Spring of 2017. He was honored to meet with Indiana State Senators Lonnie Randolph and Rick Niemeyer, Indiana State Representatives Mara Candelaria Reardon and Hal Slager, Indiana Lake County Auditor John Petalas and Archons Dr Gregory Thomas and James Thomas. 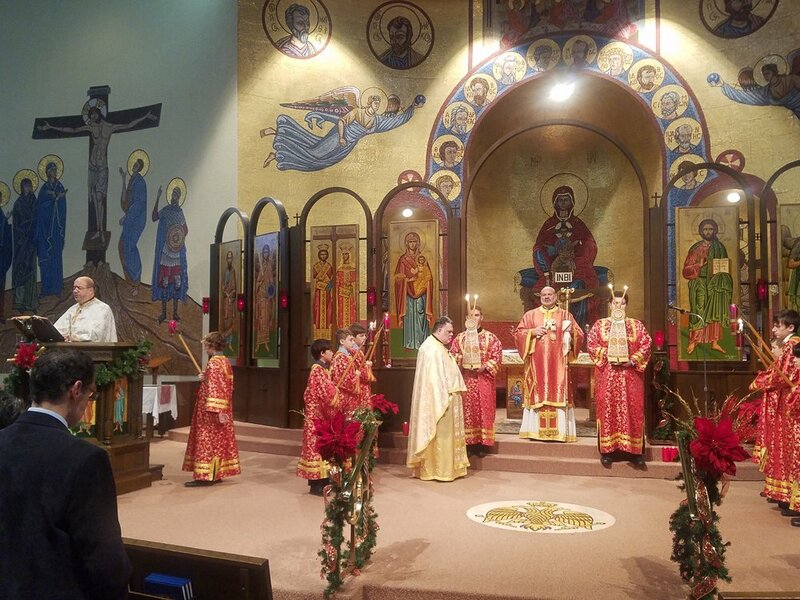 Greek Orthodox parishioners in Indiana are under the jurisdictions of the Metropolis of Chicago (Northwest Indiana) and the Metropolis of Detroit. They announced in September a new joint initiative to gain passage in Indiana of this important resolution which calls for Religious Freedom for the Ecumenical Patriarchate of Constantinople, spiritual leader of Eastern Orthodox worldwide. Similar resolutions have already been passed by 45 states, including all states neighboring Indiana, as well as the United States Congress and European Union and has received the full support of Pope Benedict, Pope Francis, former President Bill Clinton, former President George W. Bush and President Barack Obama. Bishop Demetrios was proud to hear State Senators Lonnie Randolph and Rick Niemeyer announce their endorsement and support of this resolution. Furthermore, State Representatives Mara Candelaria Reardon and Hal Slager committed to support the effort in the Indiana House of Representatives, with State Representative Reardon declaring her intent to Sponsor the Resolution in the House of Representatives. Bishop Demetrios of Mokissos servers as the Chancellor of the Metropolis of Chicago, under the leadership of Metropolitan Iakovos of Chicago. In his position, he travels throughout the Metropolis of Chicago to visit most of the parishes annually. He has received nationwide recognition for his human rights activities and interfaith outreach, including his leadership in ending the death penalty in Illinois, state resolutions calling for Religious Freedom for the Ecumenical Patriarchate of Constantinople, and just recently this year official recognition by the United States of the Genocide by ISIS against the Christian minority population of Syria and Iraq. Eastern Orthodox Christians are the second largest Christian denomination worldwide. The Metropolis of Chicago oversees all Greek Orthodox Parishes within Illinois, Iowa, Wisconsin, and Minnesota, as well as large portions of Missouri and Indiana. You can find more information on His Grace Bishop Demetrios and the Greek Orthodox Metropolis of Chicago on our website: www.chicago.goarch.org. For more information on the Archon Religious Freedom Resolution in Support of the Ecumenical Patriarchate of Constantinople, please visit www.Archons.org.